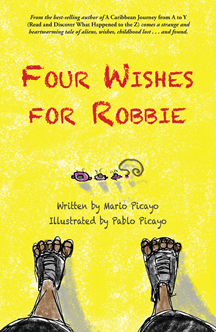 Read Four Wishes for Robbie, and follow the adventures of this young hero as his life goes from normal to very strange all because of a comic book, a mango, and four little aliens. An original, clever, and entertaining story that will delight and surprise readers of all ages. Includes a reader’s guide, interviews, and a sketchbook by the illustrator.